Every year there's one or two iOS apps that really elevate the platform to a new level for me. In the early days it was Tweetbot and iThoughts. 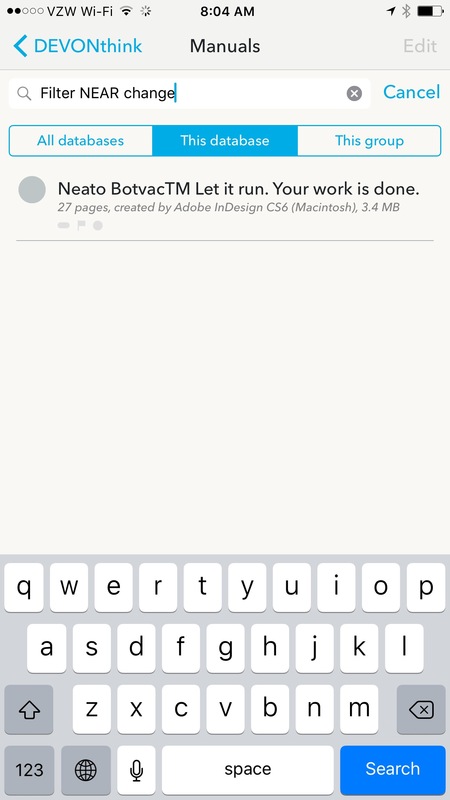 Then it was Evernote and Editorial, and Workflow. More recently, scanning applications like Scanner Pro or Scanbot have been tremendous new tools. This year I think there are two or three fundamentally new apps that really change how I use my mobile devices. The best app of the year for me is DEVONthink To Go for iOS. Disclaimer: DEVONtech has sponsored this site in the past. I'm probably biased but I also don't think I'm wrong about their software. It's top notch. 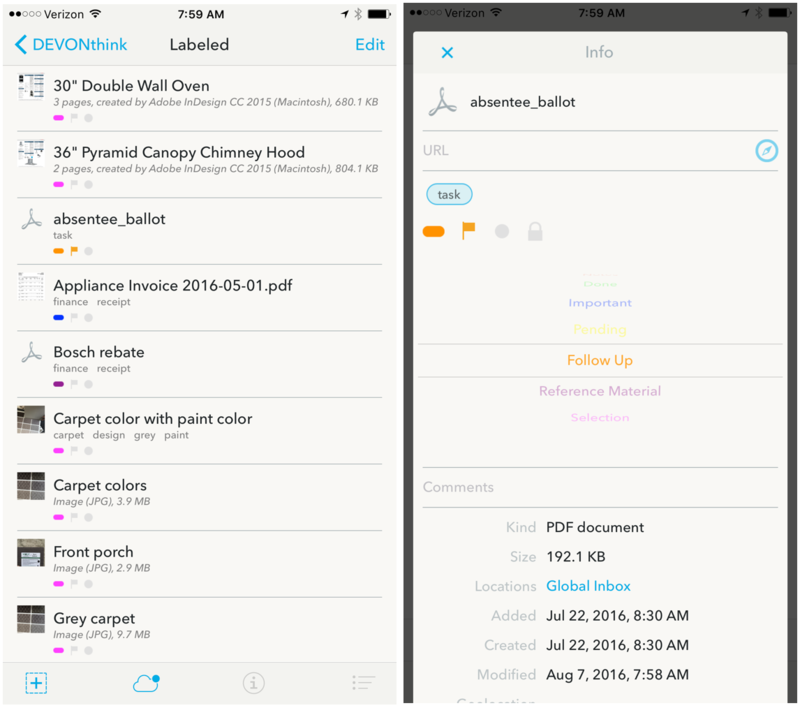 DEVONthink for iOS is a full featured, secure document manager with terrific capture tools and a really powerful PDF editing option. It supports simultaneous sync with several different services and adds encryption on top. I like it better than Evernote, Apple Notes, or OneNote. It costs $15. Buy the IAP to get better sync and PDF editing. It's changed how I use my mobile devices. I've written and recorded a lot about DEVONthink over the years. There's even a Mac Power Users episode about it. On the Mac, DEVONthink is a filing cabinet with intelligent search and automatic organization. The application learns where related documents are stored and can automatically move new documents using the Auto Classify function. On iOS, things with the first version of DEVONthink To Go were a little rocky. That all changed with the release of a completely rebuilt version 2 and a new robust sync design. DEVONthink To Go is 80% capture and 20% portable filing cabinet. For many people it will be an excellent replacement for Evernote if they don't depend on Windows or web access. The iOS app brings a bevy of new tools. The PDF editor is top notch, the quick capture is fantastically handy, and the share sheet action is indispensable to me now. I'll get to the app functions a little later but the flagship feature of DTTG2 (DEVONthink To Go 2) is the unique syncing functionality. 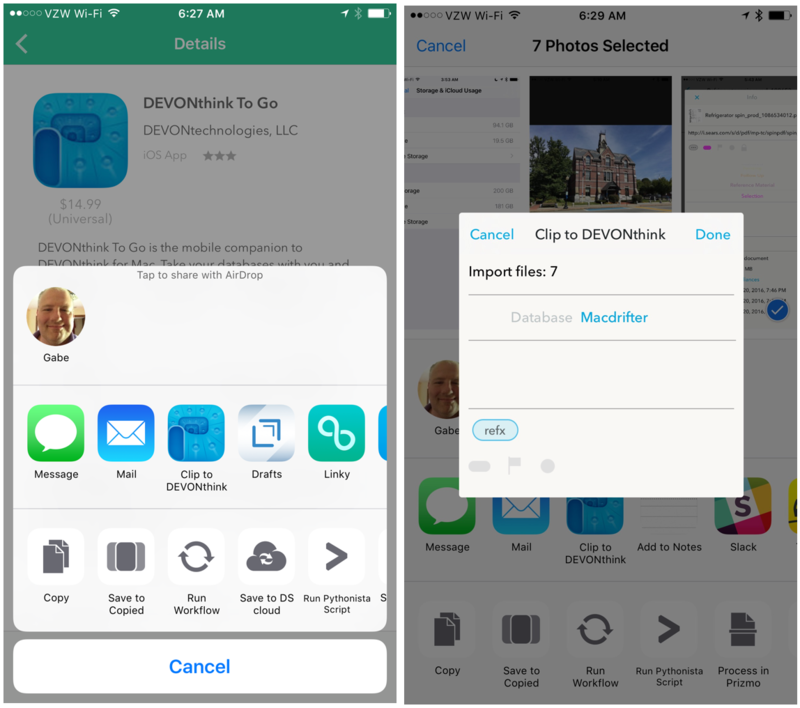 Beyond file syncing, DEVONthink for iOS has another little trick for data hoarders. We can set a sync store to only download meta data with selective download of the entire file on demand. This means I can search all of my manuals for printers, routers and stereos but not take up valuable storage space on my phone. Tapping a file downloads it on-demand and DEVONthink cleans out the file when I stop using it to free up the space again. I know people want more granular control over folder group downloads or even individual files but this works well enough for me and better than nearly anything else on the market. Devontech has developed a powerful (and fast) syncing solution without trying to insinuate themselves as the host. Instead, DEVONthink 2 Go provides a robust syncing engine with a huge variety of options. I haven't seen anything else like it. If you're worried that it's too good to be true, I can tell you that the sync works. I've had one instance where syncing seemed to fail and required me to delete the app and reinstall. After configuring the sync again all of my records showed up without any loss of information. They've anticipated the possibility of failure and allow you to choose how collisions should be handled. I have all of my databases set to duplicate files in the event of a sync and collision but I haven't seen that happen yet. I'm impressed with the performance and flexibility of DEVONthink syncing but they really set themselves apart with the security options. I don't trust Dropbox quite as much as some people do. I think they are better than most, but they aren't perfect by a long shot. The people at Devontech are clearly my kind of people. 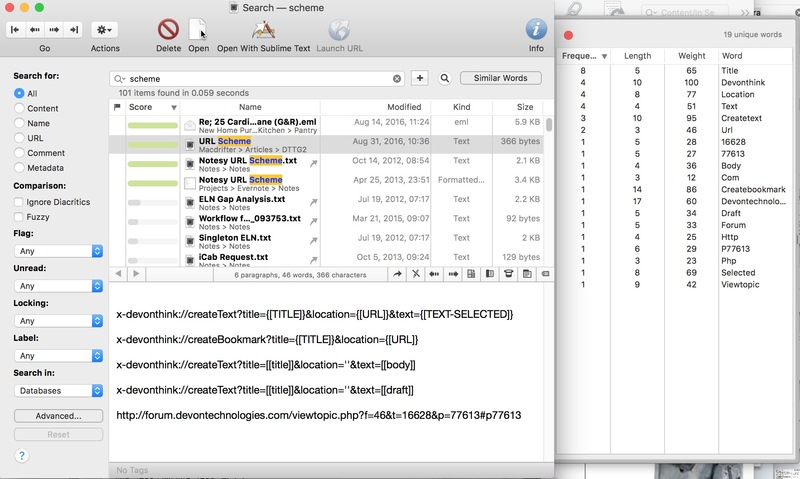 DEVONthink adds a layer of encryption between my data and Dropbox (or any of the syncing back-ends). Every sync end-point has an encryption key plus each database has a security password. I'm not an expert at this stuff but I've read their forums enough to be satisfied.5 The sync store is encrypted and decrypted only on the device. This is far better than I've seen with most note-taking applications. While this article is mostly about the iOS app, the Mac application received similar changes to the sync engine. There's now a manual "sync all" button to force all databases to sync. There's no push notification to trigger syncing automatically, but it's rare that I get to my Mac and need to trigger a sync manually. Because the Dropbox syncing for the Mac application happens through the API instead of through the Dropbox file system, you can even use different accounts than your Mac or use selective sync to avoid duplicating storage, which is pretty nice. 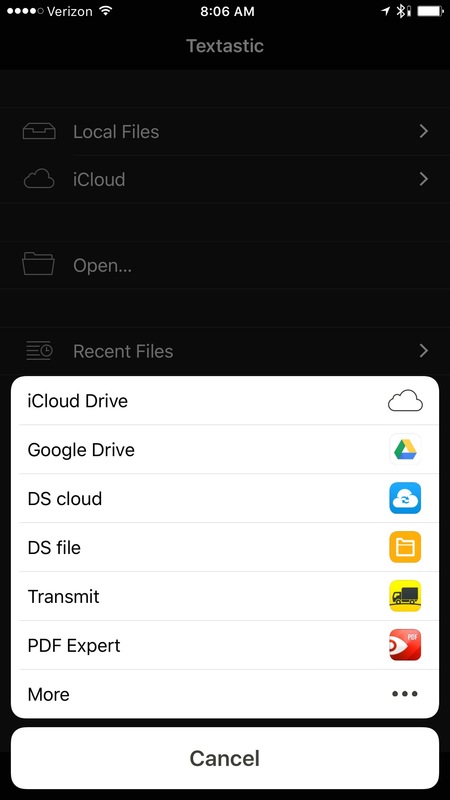 If you don't want to use any third-party service for sync, there's always Bonjour syncing direct with a Mac and iOS device. I don't use this method but Devontech has a full tutorial on their website. View all DEVONthink tutorials there. Above the purchase price of DEVONthink To Go, there's also an In-App purchase. The app is completely functional without the additional upgrade but for an extra five dollars you get several bonuses like PDF annotation. Let's be honest, the market for excellent, feature rich, productivity apps is withering in the App Store because it's so hard to make money. We're all enjoying charity work on our phones right now. That's not going to last forever so I hope good developers find a way to sustain their products. I think DEVONtech has chosen a very fair model without hobbling the app. Having access to all of my DEVONthink documents on iOS is great, but that's only half the story. DEVONthink for iOS is also a terrific capture tool. 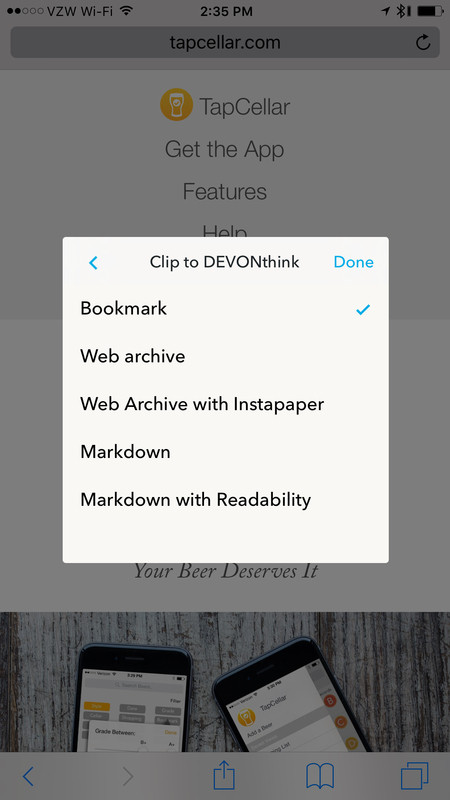 The DEVONthink sharing extension is fairly intelligent and makes quick work of getting content into the app. 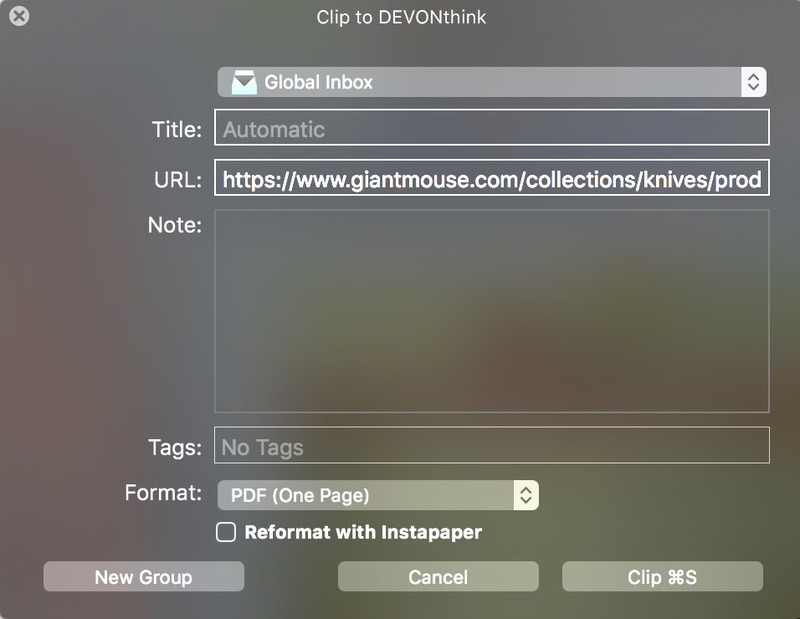 For example, select some text in Safari and share to the DEVONthink clipper to create a text note with a URL link for the page. There are also granular controls available in the clipper to flag, tag, set labels, and unread status of a clipping. The clipper also provides an option to set which database to capture to (although you can not choose a specific group folder in the database). The clipper works with all of the content types I've thrown at it. Page links, files, and text are all quickly captured to DEVONthink and marked as "unread." This does get to an annoyance of the app though. The app icon displays a badge for all unread records. It was a little maddening until I realized I could add the "Unread" smart group to the home screen of the app. While DEVONthink is a great all-purpose inbox and read-later app, I'd prefer not to have to do this. DEVONthink for iOS does not do OCR on its own. That's a major difference from the Mac version. I've solved this by using the DEVONthink clipper with one of the MANY great document scanning apps for iOS. For example, it works perfectly with Scanner Pro from Readdle. The clipper is fantastic on iOS but the DEVONthink app is also great for capture all on its own. Tapping the plus button in the lower left corner brings up the DEVONthink capture screen. If there's already content on the clipboard, DEVONthink tries to guess what kind of document I want to create. A URL is detected as a potential bookmark. Some text is recognized as a potential note, and a picture is set for quick capture as a new media file. DEVONthink for iOS is not a good text editor. It's not as elegant or powerful as Editorial or 1Writer. The meager Markdown support is in display only. There are no parenthesis pairing options, no shortcuts for Markdown characters like octothorpe or asterisk. There's not even list continuation. 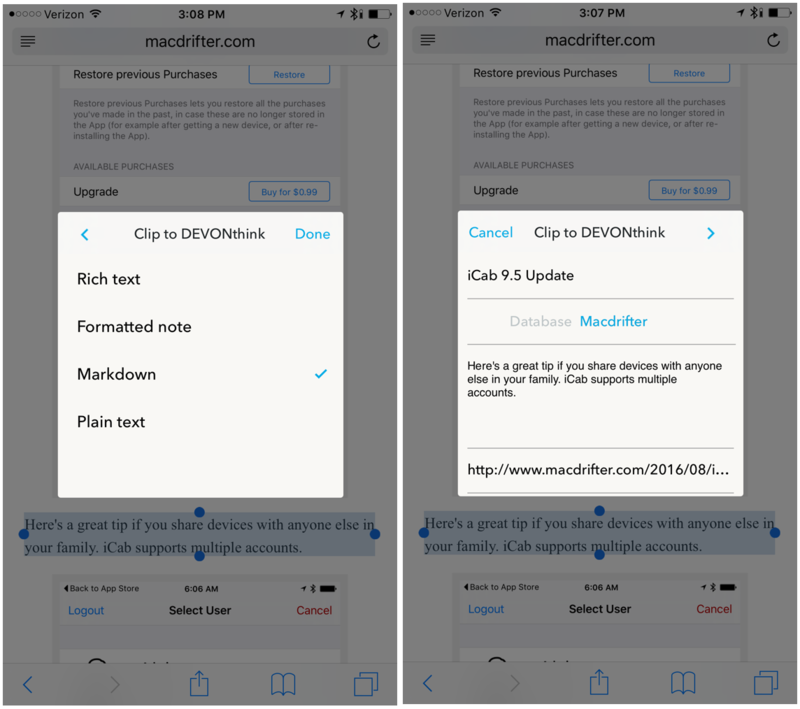 It does support rich text notes and something Devontech calls "Formatted note" which is basically an HTML document similar to an Evernote document. 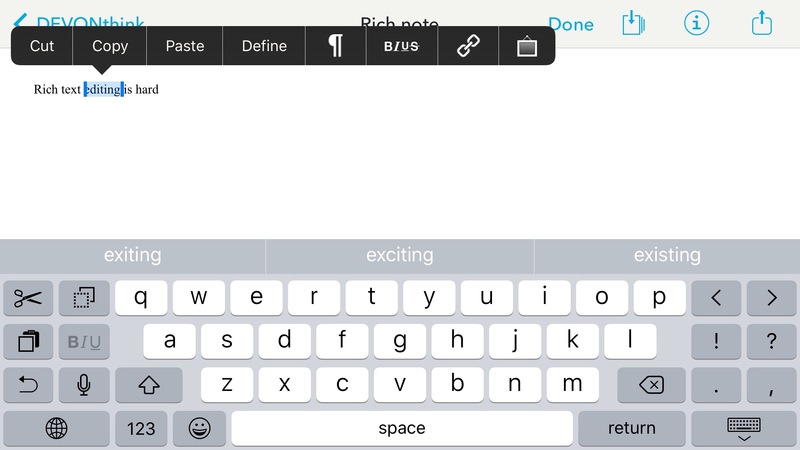 There are basic rich text features available in most note apps like Apple Notes. Rich text and Formatted notes support bold, italic, strike-through, and heading styles. Formatted notes also allow for in-line images which is very handy. 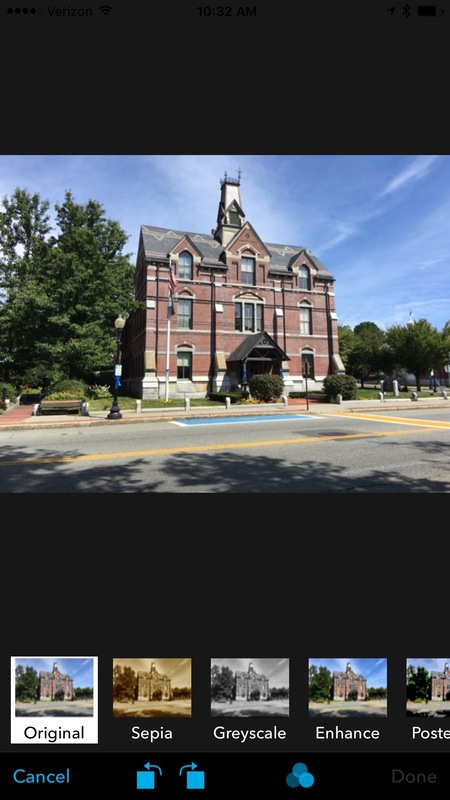 Images are inserted directly from the camera roll or through pasting into the note. The Mac version of Devonthink has much more control over formatted note creation and the iOS version can display the highlights after syncing. PDFs have a much more complete toolkit for editing. I'd go so far to say that DEVONthink is a complete PDF manager and editor. DEVONthink for the Mac has always been the best reference material organizer and that often means handling large PDFs. Now a lot of that is possible on iOS. I search for a PDF, open it, and start marking it up without ever leaving DEVONthink. 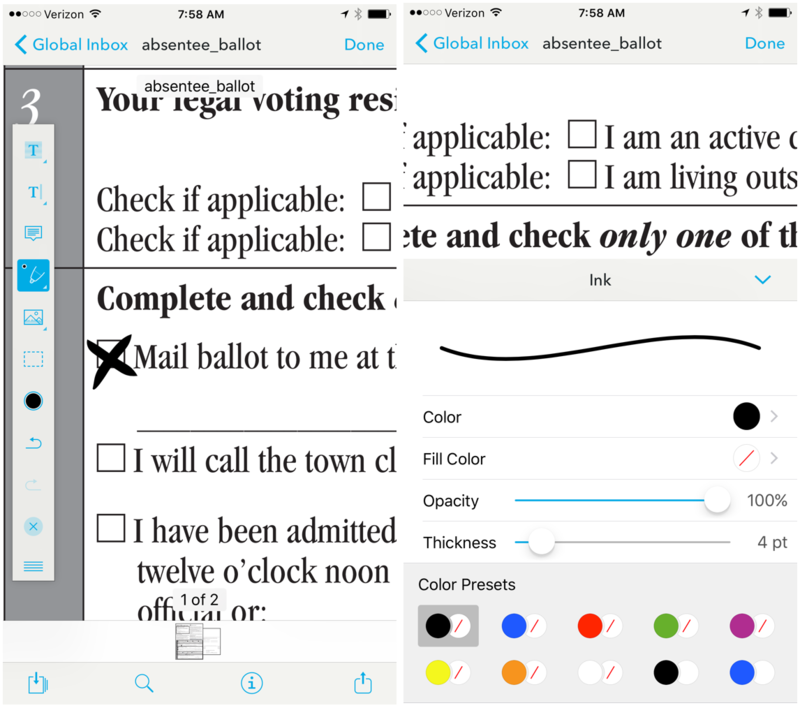 While DEVONthink for iOS also provides some minimal image editing tools, any image can be converted to a PDF from within the app. This is a great way to add markup to an image. Here's a variety of tips for working with DEVONthink. Document URLs work across the Mac and iOS. Copy a link for a document on iOS and paste it into a note and that link will also work to open the DEVONthink document on the Mac. Drafts for iOS is where I start a lot of ideas. 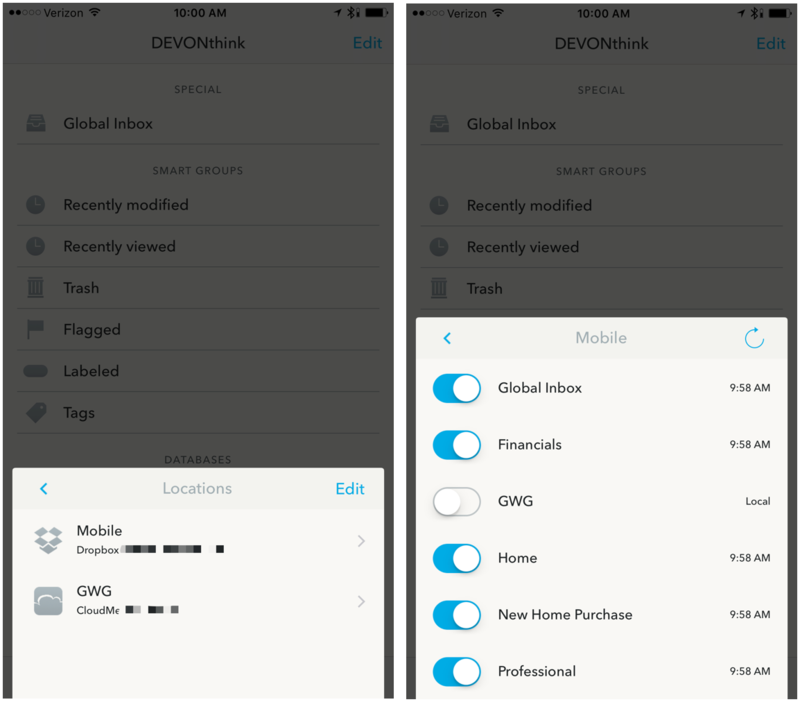 Here's a simple Drafts action to send a note to the DEVONthink inbox. DEVONthink has a variety of actions available for documents. Don't forget these. The "Add to OmniFocus" action is particularly nice since it opens OmniFocus but sets the task note to the DEVONthink document URL. This means I can open the original document in DEVONthink from OmniFocus on my phone or Mac. This is so awesome that I'm never going back to another way of referencing rich data from OmniFocus. 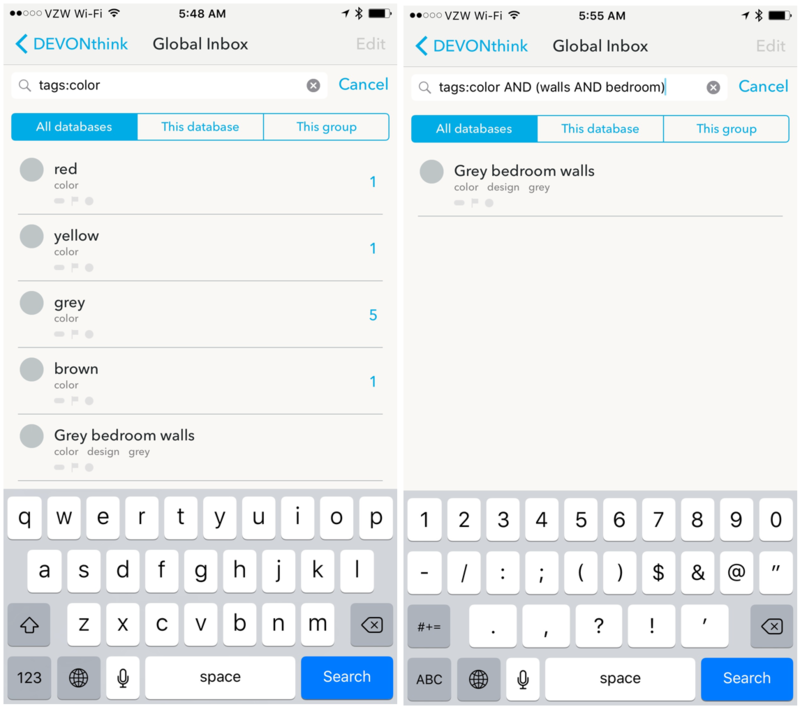 Search is more powerful in DEVONthink than almost any other app I've used on iOS, but it's inconvenient still. Unlike the Mac version, DEVONthink to Go can not save a search. However, if you are patient you can really do some precise filtering of a huge library. Go to the help section in DTTG and browse the appendix for "Search Operators" to get some idea of the engine hidden inside. DEVONthink search supports scope filters for tags. This is the only way to search by tag if you don't want to just browse. Setup some better homepage smart groups in the iOS app. Hit the "Edit" link in the upper right corner and turn on the Tag group, for starters. I also use the Flagged group quite a bit for quick access to active working documents. This is going to sound crazy, but I actually enjoy organizing my files. Scratch that. I enjoy my files being organized. When I'm bored or stuck waiting in line, I open DEVONthink To Go and start managing files. It's pretty easy to move and delete. I wish moving was a bit easier but it works well enough to pass some time. Organizing files into groups and adding tags makes it so much easier to find the right information later. When I'm back on my Mac, I get the added benefit of using the "Auto Classify" feature to move new files into the right location without needing to do more than click a button in a menu. Let's explore DEVONthink as a platform. Just as it would be unfair to judge Evernote based only on the iOS version, DEVONthink really shines when it's everywhere. The capture tools on the Mac are very good. The plugin for Safari is a terrific way to capture a web page but as usual DEVONthink goes way beyond basic expectations. The Safari plugin can capture a bookmark link or web archive. My preferred way to capture a web page is as a searchable PDF with live links. The result is portable and shows the information as it was when I captured it. If I've selected some text when I trigger the plugin, then DEVONthink also makes a note on the PDF with the selected text. The "clipper" for iOS isn't as feature rich as the Safari plugin. I can't convert pages to PDFs or use the Instapaper feature to strip out junk. But selected text is converted to note and the URL is added as link on the note. Tagging and labeling never really stuck with me except for in DEVONthink. I tried tagging in the Finder but found it too difficult to be consistent. But because there's real benefit to tagging with DEVONthink I continue to do it. Tags in DEVONthink for Mac are more like folders. I can create ontologies by nesting tags. Here's an example of leveraging tags for decorating a new house. By applying tags for colors I was able to quickly jump around paint swatches, rugs, curtains and basically everything I'd want to compare. Tags carry over to iOS as well, even if they are somewhat less convenient. Viewing a tag hierarchy shows the tags and the files with those tags. 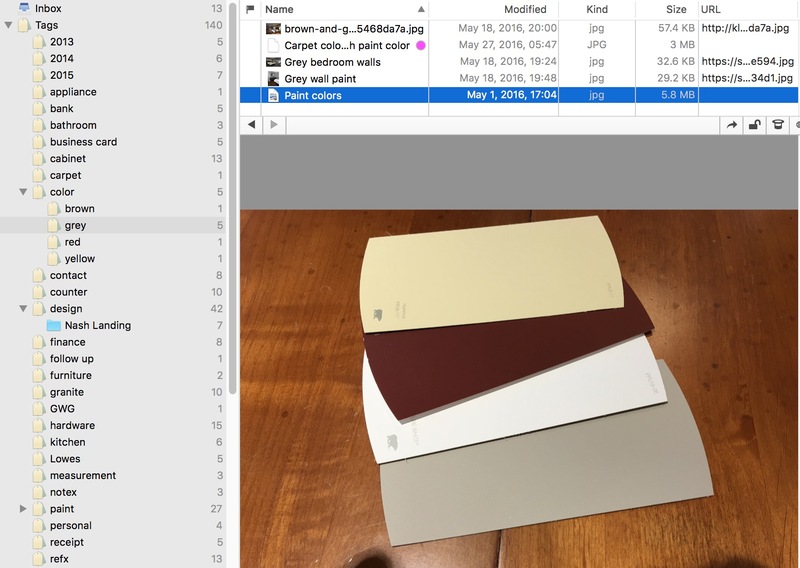 Search also identifies the files with tags, so I can just search for "brown" and see the tag as a result along with any file that has the "brown" tag on it. Labels are also a powerful feature in DEVONthink. I think of them as the top most used tags. When I'm working fast and need to keep track of active files, the labels add a subtle indicator color for files. I'd like to see this functionality expanded a bit in the iOS app to set specific labels as top level groups on the home page. While I'm trying to stay focused on the iOS app, I just have to mention one of the best reasons to use DEVONthink for the Mac: the incredible search and surfacing of useful information. Every time I recommend DEVONthink, which I do often, people ask why. With a system that does so much, it's often hard to articulate a list of reasons so I choose use case examples. Here's a few I find very useful. Let's start with the trite. I like GIFs but I find them inconvenient to access. 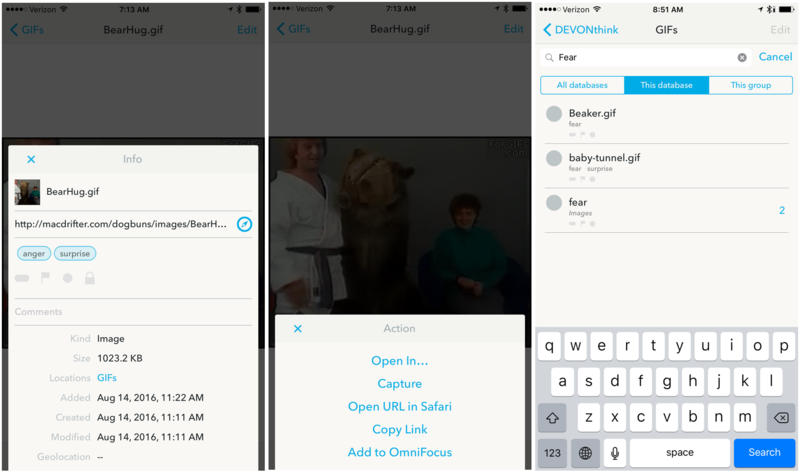 DEVONthink is a perfect little database of GIFs because of search, tagging, and URL links. If I find a GIF I really like and want to use, I just add it to my GIF database and pop in a few useful tags. The next time my friend starts to freak out during a casual Slack conversation, I just jump into DEVONthink and search for "rage" or "bear" to find the perfect motion graphic for the situation. There are several pieces of meta data that make this even more useful. Each document in DEVONthink can also have an external URL. Sometimes this is a URL to the original source on the internet. For my GIFs, they are URLs to the images hosted on my server. So I can either use the image directly or just copy the URL with a long tap in iOS. Since tags in DEVONthink are hierarchical I can build better ways to search. I create categories of tags such as "emotion" with sub categories like "rage" and "joy." Now I can either browse by tags or search the specific emotion I want to convey. This is way more fun than it should be. While building a house, I did a lot of research for appliances and other hardware. I collected it all in DEVONthink on my Mac and phone. When I went to the hardware store to look at faucets, I'd always have DEVONthink out to snap photos and take notes. That's great but eventually I need to buy just a few of the faucets I researched. I used the labels to mark specific photos and notes as a final "selection" so that when I returned to the hardware store6 I just opened the "Labeled" smart group and looked for the purple labels. Unless DEVONtech improves the support for searching by label name, I'm likely to stop using them in the future. Tags are much easier to find. Designing a home is right down there with buying appliances on the bottom of my fun things to do on a weekend list. But it still has to be done. I used DEVONthink constantly when researching paint colors, furniture, rugs and pretty much every other thing adults are supposed to care about. The tag hierarchy made organizing colors a snap. Combining tags for colors and item type, like "Red" and "Rug", really tied it all together. It meant I could easily find any thing we had thought of and review it in seconds. We're almost done furnishing the house and painting, but the research will live on when we disagree about who's fault the red bathroom is. I haven't been writing much, but boy oh boy have I been capturing references. DEVONthink To Go makes that all too easy. If I want to capture a quick affiliate link, I open Blink for iOS and send the URL to the DEVONthink clipper. If I just want to write a rough draft of an outline, I head to Drafts and then send it to DEVONthink. I've even started using DEVONthink to hold the screenshots I create for reviews. It's a temporary holding place but it's very easy to use from the Photos app share sheet. I have a separate database just for Macdrifter. All of my research goes there. 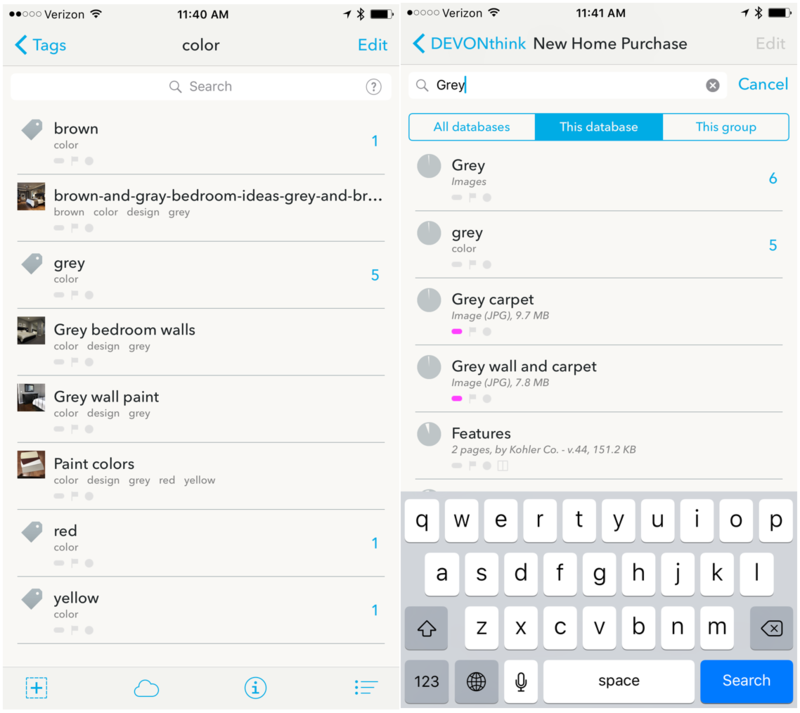 I can tag, search, and organize and then combine it all into a project (like this review). I have not moved my writing to DEVONthink though. It's not a great text editor and I prefer other tools. I'm also not ready to move my collection 2000+ text notes out of Dropbox for the same reason. If DEVONthink became a general document provider for other iOS apps like Textastic or if it had a more powerful text editor, I'd go all-in. For right now, I'm storing pretty much everything else in DEVONthink. This might be a situation best served by the on-demand download option available in the In-App purchase "Pro" pack. I already had an entire database just for storing product manuals. Every manual or tech sheet I get for my electronics, appliances, or car goes into DEVONthink and syncs to my phone now. It doesn't take up a lot of space in comparison to Live Photos or podcasts and it's a huge convenience when I need it. If I forget how to program my garage door opener, I can open my phone and look up the manual without even getting out of the driver's seat. The search in DEVONthink really makes this a useful idea for me. Using the "NEAR" operator I can search my collection for how to change the filter in my little robot vacuum without needing to scour the web for 20 minutes. It's great. I'm a huge fan of Pinboard for bookmarks. I've written hundreds of words about my fandom. But when I'm really researching a topic, it can be difficult to pull together everything from just bookmark URLS and simple text notes. DEVONthink is real pleasure to use for web research. It's called DEVONthink To Go 2 but it really feels like an entirely new app. Nothing about version 2 reveals the dark days of version 1. DTTG2 is the kind of app that makes me want to carry an iOS device at all times. It's utilitarian but that utility fills a big gap for me — instant capture and information surfacing. DTTG2 is inexpensive in my book. While there are still some rough edges around text editing, documentation, and organizing files, this is a great version. It's on my home screen and it's almost always active on my phone. I can recommend it whole heartedly to anyone that read this far because you're the kind of nerd that will love it. If you want to read more about DEVONthink for the Mac, I have a few articles for you on this site. It's one of my favorite apps there too. If you save data at all, DEVONthink can probably make life a bit easier for you. In App Purchase features (so far): Download on demand, PDF annotations, support for additional document types like email and sheets.